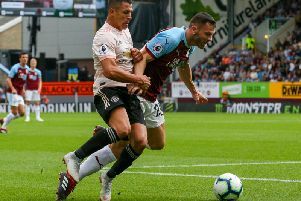 Football is all about finding the right balance, and Sean Dyche is hoping to do that on and off the pitch as the Clarets juggle the bread and butter of their league form and European commitments. Dyche is looking forward to taking on the challenge of Europa League football, with Burnley’s second qualifying round first leg against Aberdeen at Pittodrie coming up a week next Thursday, on July 26th. Burnley returned to training last Monday, and have spent this week in Cork, with a five-day camp rounded off by their first friendly against Cork City at Turners Cross tonight. And Dyche said: “It’s a strange thing about the psyche, because it’s a tremendous thing for Burnley Football Club to be in Europe. “It’s not there to be taken lightly, and we won’t be doing that, but it has to be balanced against the Premier League. “You can go back into that debate of downplaying cups, but it’s nothing to do with that. “The fact is the Premier League is our bread and butter, but alongside that, the first time in Europe in 51 years means we are looking forward to that as well. Burnley have yet to add to their squad over the summer, having had a combined £25 offer for West Brom’s Jay Rodriguez and Craig Dawson turned down, and Dyche added: “There’s a lot going on and we have to make sure we can add to the group to add to this upward curve. “It’s a broken record from me, but we are not the likes of Manchester City or Chelsea, where they can just go and get this or that player. “Our club still has to make sense as a business and that often makes things tricky and not as easy to get deals done, but I am used to that.